The bad news is that this is the last post on AFA, at least for a long while. The site's articles will remain online, but there will be no new content. The good news is that I'm pleased to announce that AFA is merging with ESPN! The two titans of the sports industry will be soon joining forces to create one giant mega-sports outlet. There are a few details left to be decided in this merger-of-equals, like what the name of our new company will be. So far we've ruled out AFAESPN and ESPNAFA. For some reason the guys in Bristol absolutely insist that it simply be "ESPN," and since marketing isn't my thing I'm inclined to throw the boys in Bristol a bone. In all seriousness, ESPN has acquired an exclusive license for all my tools and models. 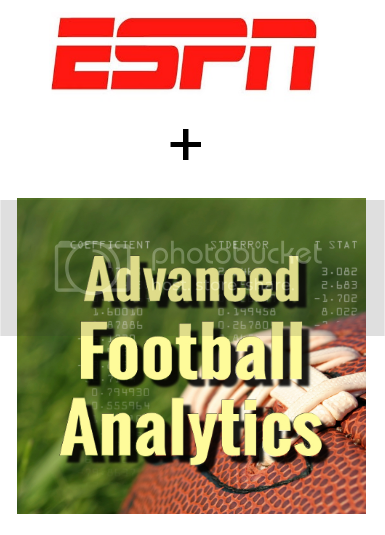 I'll also be joining the ESPN analytics crew full-time. This is a great time to turn the page. I love AFA and the community it helped build, but I think the site has reached its potential. It has certainly put a dent in the football universe. The usefulness of my research is currently constrained by the richness of the data I have access to. With more detailed data--stuff beyond 'was the play a run or pass?' --there are all kinds of fruitful paths to follow. With ESPN's resources at hand, I'll be able to take things to the next level. I'm looking forward to joining a very talented and accomplished group, and I'm also excited about branching out into other sports more. Thanks to everyone for helping make AFA into what it has become. Thanks for the corrections, suggestions, criticism, and encouragement. Thanks for all the kind emails. Thanks for the opportunities at places like the NY Times, Sports Illustrated, and Slate to bring football analytics to a broader audience. Thanks to the legends of the field, like Virgil Carter, Jeff Sagarin, and the Hidden Game of Football authors. Thanks for the inspiration from sites like Fangraphs, Football Outsiders, and the old PFR Blog. Thanks to my buddies Jon and Todd for listening to my kooky theories at work. Thanks especially to my dad, who knows a thing or two about NFL stats. I'm grateful for everything that made AFA possible.